Do you want to be able to tune in the digital TV channels broadcast over-the-air to the TV? Yes, it can be done by using a digital TV tuner. The digital set-top box can receive the digital FTA broadcasts. In addition to providing more channels with the new tuner, you have the enhanced Electronic Program Guide (EPG) and information plate. How to hook up a DVD recorder and VCR to your TV with Freeview. 1) Cable to provide TV signals to RF input on digital TV set-top-box. 2) Cable to pass converted TV signals to DVD Recorder. 3) SCART cable for Freeview output to TV. 4) SCART cable to connect DVD recorder to TV. 5) SCART cable to connect DVD recorder to VCR. 6) RF cable to connect DVD recorder to VCR. 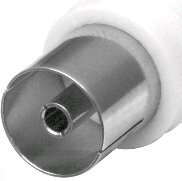 7) RF cable to connect VCR to TV. You can watch TV normally by selecting the set-top-box input on the TV or watch a videotape from the VCR by selecting the RF input on the TV. You can record TV shows on the DVD recorder and watch on the TV by selecting the alternate scart input on the TV. • What you will see on the back of the set-top-box. 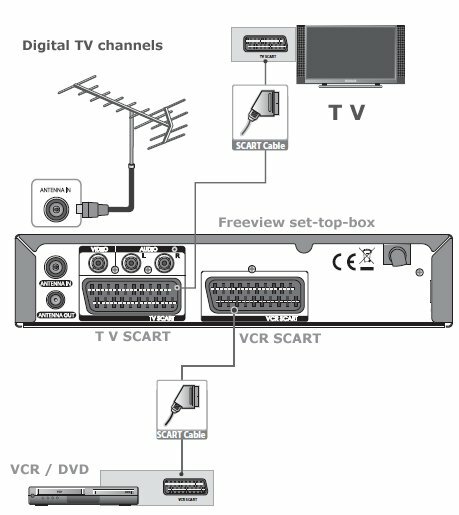 Having trouble setting up or connecting your digital TV box? The cable from the rooftop aerial should connect in to the RF in socket (might also be marked antenna or aerial or ant in) on the back of the digital box. The box should have two scart sockets, the 1st marked TV (or might be just scart1) should connect to the corresponding scart socket on the rear of your TV set. 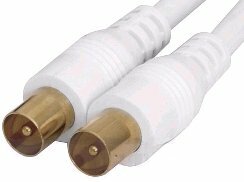 If your TV does not have a scart socket it might have AV (Audio/Video) sockets instead, these are 3 individual round "phono" sockets coloured red, white and yellow and you will require a RCA lead to connect this to your box. (see an electrical retailer for details). If your TV has not got this and only has the normal RF aerial socket you will not be able to connect it directly to the digital box unless the box has a RF modulator and output. Very few boxes have this. Check with your manufacturer or electrical retailer. You might be able to connect the box to the scart socket on your VCR and watch Freeview on your TV's video channel instead. The 2nd scart socket on the rear of the digital box is usually marked as Video (or just as scart 2). This should be connected to the scart input socket on the rear of your VCR if you have one. The RF output socket on the digital box connects to the aerial input on your VCR if you have one or otherwise to the aerial socket on the rear of your TV. Finally your digital box's power cable needs to be connected to the power socket on the rear of the box and then plugged into an AC wall socket. Check your batteries in your remote control handset then switch on the digital box. Set your TV channel to AV or SCART or EXT and you should see the digital box welcome message or menu screen. Now follow the setup or tuning instructions on screen or follow the advice in the appliance's user manual. Most digital TV boxes come with an ‘RF loop through’ which carries the aerial signal to the RF output. A few boxes have an RF modulator which also sends the selected digital channel through the RF cable to TVs that have no scart sockets. In this case you will need to tune your TV to receive the digital channels throught the RF cable. If you want to use a video or DVD recorder then take the RF output from the digital box to the RF input of the video or DVD recorder. Then run a scart cable from the VCR output of the digital box to the A/V input of the VCR. Connect the video to the TV with both an RF and scart lead – ideally your TV would have at least two scart sockets. Then tune the video into the analogue TV channels as normal. To record digital channels select the A/V channel on the DVD recorder/VCR that corresponds to the input connection from the digital box. Most digital TVs will find both the analogue and digital channels that are available in your area. Connect the aerial and follow the set up procedure in the manual. Then use your TV remote control to switch between analogue and digital using the analogue/digital or A/D buttons on the remote. If you are thinking of buying a digital TV ask your retailer about how you can view both digital and analogue. The United Kingdom will by the end of 2012 complete the national television switchover to all digital TV terrestrial broadcasts. The transition from analogue TV to digital TV broadcasts has been going on for several years. The change from analogue to digital TV means you may need to make some decisions about how you want to view TV. Question: Will I have to buy a new TV? Answer: No, your old TV will still work, however, you will need to make some changes. 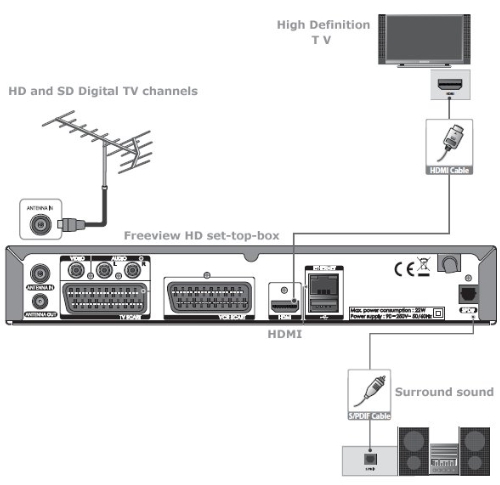 For an analogue TV, you will need to get a digital TV set-top-box capable of tuning digital broadcast TV signals and converting them to analogue for your TV. Also, if you have been recording TV, additional changes will need to be made. A digital TV box lets you access the free digital channels broadcast in the UK. The digital TV signals received by your existing aerial and processed by the digital TV box, lets you view over 40 channels on your existing TV. Some digital TV set-top boxes, video recorders and DVD recorders have a built-in 'Modulated RF output'. This means that the box can 're-broadcast' it's output onto a TV channel, so that your TV set can 'tune in' to the signal in the same way as you can tune your TV set into a certain channel. If your box doesn't have a modulator, you can only watch/record on equipment with a SCART socket. You can also buy a stand-alone RF modulator box with a SCART input and a RF output for connection to the TV set's aerial input. If there's no RF modulator, the aerial output only provides an analogue loopthrough facility and doesn't output digital TV channels for TVs with no SCART socket. Question: How do I know which digital TV set-top-box to buy? HD will use MPEG-4, not MPEG-2 used in standard definition broadcasts, so if you want HD, get an HD box now rather than paying for a new box twice. Also, you could buy a new TV with integrated digital TV tuner. Then, no box would be required for Freeview. If you're looking to buy a cheap Freeview box for terrestrial digital TV there are many budget set top boxes to choose from under £50. However, a better box with recorder and twin tuners can be £150 or more. For more information on what to look for in a Freeview box, see Freeview box - Features to look for. Question: What is the difference between the old analogue TV standard and the new digital TV system? Answer: The old analogue broadcast TV standard used a system called PAL, short for Phase Alternating Line. The PAL standard uses 625-line / 50 field (25 frame) per second television signals (only 576 lines carry actual image). All analogue TV sets made for PAL TV reception had a compatible TV tuner built-in. The same is true for VCRs. This is why you need the new TV box or new TV set - your PAL TV tuner will not work with the new digital TV signals. The new digital broadcast TV standard is DVB-T. DVB-T is an abbreviation for Digital Video Broadcasting — Terrestrial; it is the DVB European-based consortium standard for the broadcast transmission of digital terrestrial television that was first published in 1997 and first broadcast in the UK in 1998. This system transmits compressed digital audio, digital video and other data in an MPEG transport stream, DVB-T is the most widely deployed DTT (Digital Terrestrial Television) system worldwide, with over 60 countries that have adopted or deployed the DVB-T standard and more than 200 million receivers deployed. The new digital TV signals use some of the same radio spectrum in the UHF band as the old analogue TV signals. This is why you can still use your current TV aerial to pick up the UHF broadcasts. Question: Will my VHS tapes and DVDs still play as before on my TV? Answer: Yes, the only difference may be in the method of connection. Answer: HD is High Definition. High Definition refers to both HD broadcasts and HD television displays such as Plasma or LCD big screen TV sets. HD is always digital but digital TV broadcasts are NOT always HD. HD is 720 or 1080 lines compared with the 625 lines of analogue TV. More detail gives a sharper picture. SD or standard definition is digital TV but not High Definition. Most channels broadcast currently in digital are SD. Question: How do I record one channel while viewing a second channel? Answer: You need two digital TV tuners. You can buy a second set-top-box for your VCR or DVD recorder or get a twin tuner set-top-box/recorder. Answer: Re-tune or channel scan is a set-top-box function which can be performed at any time to store the available channels in your location in the memory of the set-top-box digital tuner. Once the channels are stored, the tuner can go directly to the channel you select on the remote control of the set-top-box. This function has to be performed if any channels are added to your available broadcast TV selections or if any changes to your channels are made at the source of transmissions. Some boxes will perform a re-tune automatically to be sure the current channel frequencies are stored. Question: How do I re-tune? Answer: Each tuner is slightly different but the procedure is usually a simple process of pressing MENU on the remote, selecting the area for channel re-tune such as Installation and waiting for the scan to complete. For some user guides on various boxes see the link below and download the instructions. Answer: Freeview is a digital TV service available terrestrially in the U.K. It uses DVB-T, the standard European technology for broadcast transmission of digital terrestrial television. The service is growing fast in the U.K off the back of its appealing 'free' status: As opposed to pay-per-view, the TV and radio channels available on Freeview are free to watch/listen to, with the only usual cost outlay being the purchase of a set-top box to allow your TV to receive digital signals. However it may sometimes be necessary to pay to upgrade your TV aerial. Most new TVs bought today are already digitally enabled with no need of an additional set-top box. Freeview was launched on October 30, 2002. The launch consortium consisted of the BBC, BskyB and National Grid Wireless. Consortium members plus others now broadcast around 40 TV stations and over 20 radio stations. By March 2006, Freeview was available in an estimated 6.4 million U.K homes. Freeview is a box that you plug into your television to get extra channels. Question: Why must I get a Freeview box if I have an analogue TV? Answer: Because the new digital TV signals are incompatible with your analogue TV. The Freeview box will tune and decode the digital TV signals, then convert them from DVB-T to PAL for your analogue TV. The alternatives are 1) buy a new digital TV or 2) get SKY satellite TV or 3) get digital cable TV. Question: Can you list all the channels that you get on freeview? Answer: You get over 30 free TV channels and 20 free digital radio stations with Freeview. The entertainment channels include BBC 1, 2, 3 and 4, BBC I, ITV 1, 2, 3 and 4, ITV play, channel 4 and channel 5, Sky three, UKTV history, more 4, E4, E4+, Film 4, ABC 1, FTN Full On, Quiz Call and Smile TV. Lifestyle channels are QVC, UKTV Bright Ideas, Ideal World, Bid TG, Price Drop TV, Community Channel and Teachers TV. Children's TV offers C BBC, Cbeebies and ITV C. The hits and TMF provide music and the news channels are BBC News 24, BBC Parliament, Sky News, Sky Sports News and Teletext. Freeview offers regional coverage in Wales, Northern Ireland and Scotland. You can start to receive digital transmissions by acquiring a digital box and connecting it to your TV set. You can also get a digital TV recorder or new digital TV to receive freeview programmes. Question: What does a Freeview HD box give me? Freeview set-top-box diagram shows connections for all digital TV channels switchover. DVB-T stands for Digital Video Broadcasting - Terrestrial and it is the DVB European consortium standard for the broadcast transmission of digital terrestrial television. This system transmits a compressed digital audio/video stream, using OFDM modulation with concatenated channel coding (i.e. COFDM). The adopted source coding methods are MPEG-2 and, more recently, H.264.